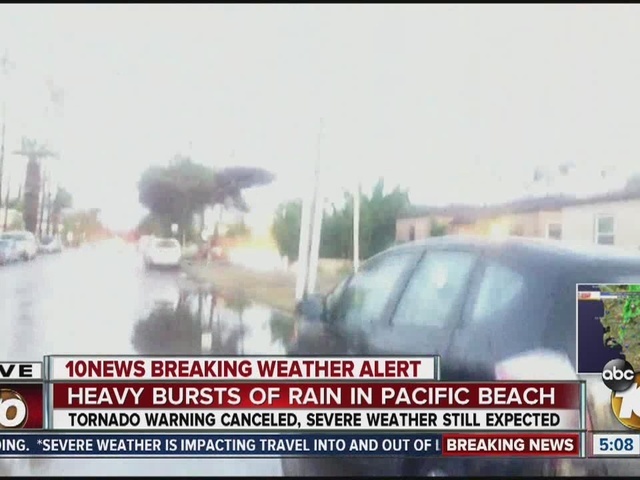 The latest in a week full of intense El Niño-driven storms drenched the already soaked San Diego area today, swamping numerous streets and necessitating a spate of water rescues for a second day in a row while delivering significant rainfall and some dustings of mountain snow. The severity of the blustery atmospheric system moving through the region prompted the National Weather Service to issue a rare tornado warning for the western and central sections of the county shortly before 3 p.m. 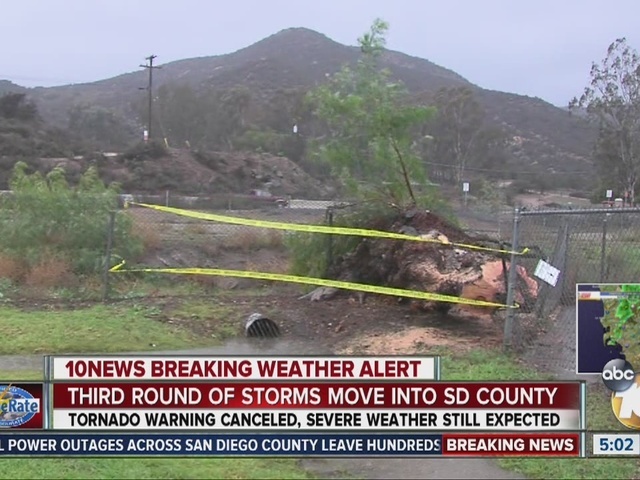 There were no confirmed twister sightings as of early evening, though several areas, including Poway and Vista, sustained some damage from heavy winds, the NWS reported. Over the day, the storm generated gusts up to nearly 45 mph along the coast, and ones considerably stronger in the East County highlands, with a maximum reading of 63 mph on Palomar Mountain. As was the case Tuesday, the cloudbursts left many stretches of roadway in various communities under pooled or fast-flowing runoff. 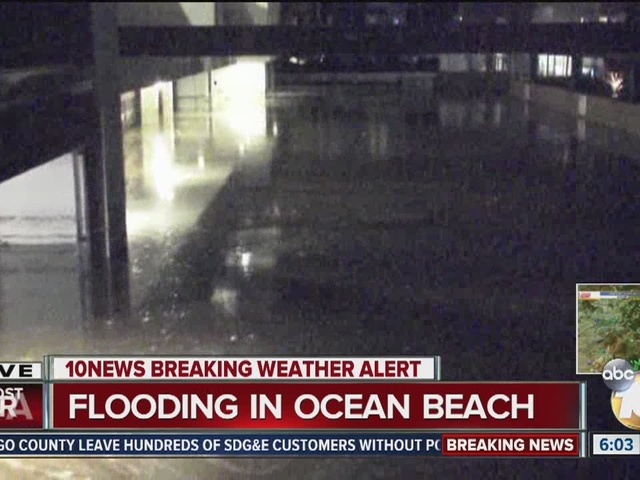 Emergency crews rushed to rescue people stranded in half-sunken vehicles in Clairemont Mesa, the Miramar district, the Torrey Pines area and other neighborhoods, officials said. No serious injuries were reported. About 4 p.m., a roughly 4,000-square-foot section of rain-saturated roof at a FedEx shipping facility on Olson Drive in Sorrento Valley collapsed. The mishap resulted in no injuries but prompted a full evacuation of the large building, according to the San Diego Fire-Rescue Department. Broken sprinkler pipes then added to the serious flooding problem in the structure. The cold front also began dropping snow in the highest reaches of the region, according to meteorologists. Over the next few days, the frozen white flakes may fall as low as the 4,000-foot level and accumulate into drifts a foot or more deep in some locales. During a 24-hour period ending at 5 p.m., the banks of dark clouds dropped 2.54 inches of precipitation in Julian; 2.49 in Birch Hill; 2.26 at Henshaw Dam; 2.24 in the Palomar area; 2.08 on Volcan Mountain; 1.99 in Echo Dell; 1.77 at Miramar Lake; 1.68 in Descanso; 1.67 in Oak Grove; 1.64 in Borrego Springs; 1.47 in Poway; 1.38 in Oceanside, Flinn Springs and San Diego Country Estates; 1.37 at Ramona Airport; 1.36 in Alpine; 1.31 in Ranchita; 1.2 in Valley Center and Warner Springs; and 1.1 in Kearny Mesa. Fallbrook; 0.61 at Lindbergh Field; 0.52 in Campo; 0.48 in Ocotillo Wells; 0.4 at Montgomery Field; 0.21 at Brown Field; 0.2 in Point Loma; and 0.06 in Solana Beach. Henshaw Dam, 4.16, the NWS reported. As of early this evening, the heavy storm activity was moving out of the region to the southeast. Scattered showers were expected to continue this evening and overnight, with more strong rain and eastern snowfall predicted to hit the county Thursday morning or afternoon, forecasters said.